The purpose of this handout is to provide you with some guidance on how to write essays and other research projects using either MLA or APA style. You will find information about the basics of both the MLA and APA style and how to correctly cite your sources. Please keep in mind that this handout only covers the basic elements of the each style; therefore, your teacher may need to share more detailed material with you in order to complete your essays or project. If you have not given proper credit to your sources, you have committed plagiarism. Essentially, it is like you are lying to your reader. You have used someone else’s ideas without telling your reader from where you took those ideas. For example, you have a new iPhone that you purchased with your own hard earned money. So, someone walks by your locker and sees your new iPhone on the top shelf. He decides to take your iPhone and go buy a new case for it. He syncs your iPhone with his computer and downloads music on it. He programs it with a new number and syncs all of his contacts to his new iPhone. Does that iPhone belong to him just because he has set it up with a new number and download his apps and music to it? It is the same with information. Whether you have intentionally tried to pass off someone else’s ideas as your own or through careless research or you unintentionally forgot to cite the source, it is still plagiarism. Any idea or fact that you receive or learn from a source needs to cited. Any idea or fact that is common knowledge does not need to be cited. For example, a fact like the earth rotates around the sun is common knowledge and would not need to be cited. If you are unsure if something should be cited, then CITE IT! The Modern Language Association, MLA, developed a style guide for academic writing. MLA provides guidelines for the creation of a bibliography, known as “Works Cited” and the corresponding parenthetical, within text, citation. Students are expected to be familiar with the MLA style when writing or creating projects within the Language Arts curriculum that contain information from other sources. As a writer, it is your responsibility to give proper credit to the sources from which you gather information. It is also very important that you document these sources using the MLA style. If you do not give proper credit to a source, you have committed plagiarism. The MLA Guide is a color coded handout that can be used to help provide the proper credit to the sources from which you gather information. Always remember to check with you teacher about sources and project guidelines. 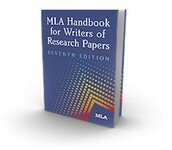 The MLA Guide has a color coded chart at the top, listing all of the information that is needed in order to provide the proper credit in MLA style. MLA style follows a pattern or format for all citations both in text as well as on the Work Cited page. Specific types of sources are used at NMS when completing a project. Examples of these sources can be found on the MLA Guide. The MLA pattern or format is given and is followed by a specific example. Citation examples are given for both "IN" text citation, as well as "OUT" on the Work Cited page. Please remember to always check with your teacher about project guidelines and expectations for using the MLA citation style. The American Psychological Association, APA, developed a style guide for scientific writing. APA provides guidelines for the creation of a bibliography, known as “Works Cited” and the corresponding parenthetical, within text, citation. Students are expected to be familiar with the APA style when writing or creating projects within the social science curriculum that contain information from other sources. As a writer, it is your responsibility to give proper credit to the sources from which you gather information. It is also very important that you document these sources using the APA style. If you do not give proper credit to a source, you have committed plagiarism.